Be the first to share your favorite memory, photo or story of Kristin . This memorial page is dedicated for family, friends and future generations to celebrate the life of their loved one. 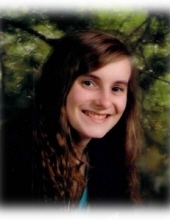 Kristin Renea Hunt 24 of Rogers, passed away March 24, 2019 at her home. She was born September 26, 1994 in Springdale, Arkansas the daughter of Stephen Hunt II and Jennifer Crawford Rice. She was a member of the House of Prayer Church in Rogers. She is survived by her father Stephen Hunt II; mother Jennifer Rice, step-father Michael Ray Rice, her siblings Sean Rice, Robin Coker, Brandon Rice, Mitchell Rice, Teresa Munoz and husband Edim, nieces and nephews Braxton, Calvin, Katherine, Anna Belle and Issac. Funeral Services will be held 1:00 p.m. Thursday, March 28, 2019 at the House Prayer in Rogers, Arkansas. Interment will follow at the Pratt Cemetery in Garfield, Arkansas. Arrangements by Benton County Funeral Home 306 N. 4th St. Rogers, Arkansas. To send flowers or a remembrance gift to the family of Kristin Renea Hunt, please visit our Tribute Store. "Email Address" would like to share the life celebration of Kristin Renea Hunt. Click on the "link" to go to share a favorite memory or leave a condolence message for the family.